The placid text of the cornerstone does not tell of Mexican bandit train holdups eradicated just a few years before in this river port and border town in the Rio Grande Valley. It is hard to find anyone in Brownsville who does not speak Spanish as easily as English, and in those days Yiddish too. Recent immigrants from Central and South America have maintained the Hispanic character of the Jewish community and the city, all of which is readily apparent in the old Temple Building. The original 1931 building, shown in the foregroound, is constructed in the regional vernacular of plastered masonry and cleverly but simply detailed with inset clay tiles as roof scuppers and foundation vents. 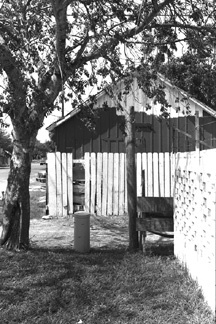 In 1951 a fellowship hall with kitchen, restrooms, and stage was added, creating a pleasant outdoor court in between. Some years later an adjacent residence (not shown) was incorporated in the complex as a Sunday school and office. This interior view from the original building to the newer hall across the courtyard shows the interior arrangement of pews, the raised bimah and the north (not east) end, and the coffered ceiling above. The ark and reader's stand remain to be restored pending receipt of descriptive information. The neighborhood has a lively, now wholly Hispanic, flavor. The apartment house was likely built in the late 1920's and is indicative of the style and vigor of the area.